The state of Oregon is full-blown Communists. These anti-Americans running the show in the Western state have implemented their newest man-made, constitution-violating laws in the form of Red Flag “laws,” and those “laws” have resulted in nearly 50 people having their property stolen from them even though they were not charged with a crime nor were found guilty of a crime. 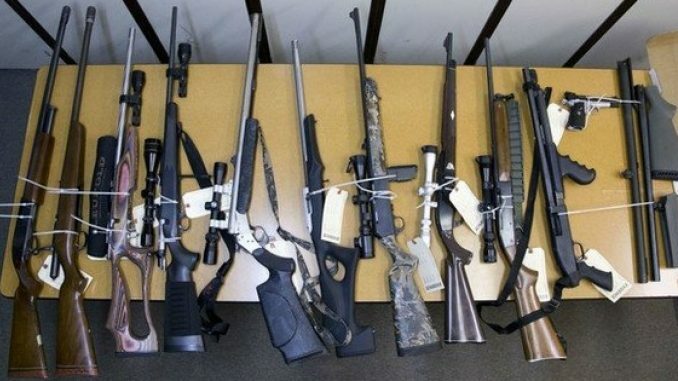 In a June news story “Shots Not Fired,” The Oregonian/OregonLive reported on the first several dozen gun seizure orders issued under the new law. The newsroom’s analysis showed judges ordered guns seized mostly from people affected by substance abuse, anger or mental health problems. Research presented to lawmakers Wednesday indicates that trend has continued. “I believe that this legislation is an important component of a comprehensive approach to gun violence reduction,” Reese testified. He also said that “most” of “extreme risk protection order” cases in Multnomah County arose from a person’s threats of suicide. In several cases, people brandished weapons and threatened to shoot themselves or others. Fair enough. If a person is brandishing their weapon, don’t they have a law against that? If the person is threatening to shoot others, isn’t there a law against that? OK, then why do you need this red flag “law”? It’s because the devil is in the details. Reese used the word “most,” not all. That means there are a number of people who have their property stolen by the government when they have not actually committed a crime. This is very dangerous people. I have no problem with people losing liberty if they have committed a crime and get due process, but it is not the job of government to take people’s property if they have committed no crime. On the heels of a gun suicide in one lawmaker’s family and amid confessions of domestic violence in another’s, the Oregon Legislature narrowly passed a law in 2017 giving judges discretion to pry guns from people not convicted of a crimewho show signs they might shoot themselves or someone else. If the goal is simply to get guns out of their hands, but fail to charge them with a crime, isn’t that telling to anyone reading this?